So for Blog Action Day today, which is a day all bloggers will write about a single issue, the environment, in their own special way... and so Austin Hip-Hop Scene would like to acknowledge today... the environmental contributions of the green sticky-icky. May one day all realize it's benefits. 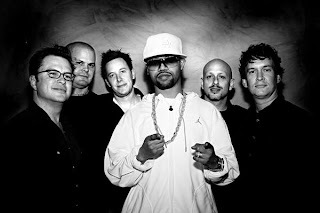 Galactic is a funk and jazz group from New Orleans, Louisiana, United States. Originally formed in 1994 as an octet (under the name Galactic Prophylactic) and including singer Chris Lane and guitarist Rob Gowen, the group was soon pared down to an instrumental sextet comprised of: guitarist Jeff Raines, bassist Robert Mercurio, drummer Stanton Moore, saxophonist Ben Ellman and Hammond organist Rich Vogel, later adding Theryl DeClouet on vocals. The group was started when Raines and Mercurio, childhood friends from the Washington D.C. area, moved to New Orleans together to attend college at Tulane University, and became enamored of the local funk scene, populated by such legendary acts as The Meters and inspired by local legends such as Professor Longhair. There they teamed with noted New Orleans drummer Stanton Moore, who eventually became the driving force behind Galactic. In 2004, the band parted ways with vocalist DeClouet, and now continue as an instrumental group. The band has developed a unique sound as a result of their influences, including: hip hop, Go-Go, electronic, world music, Latin music, rock, blues and jazz.